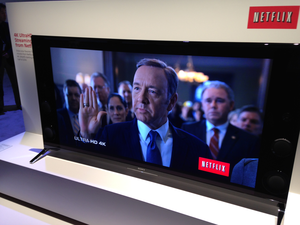 One of the most undeniable trends as this year's CES expo was 4K TVs. There were giant 4K sets, curved 4K sets, and bendable 4K sets. But all that 4K action might leave you wondering: what does 4K mean? And what effect does the onslaught of 4K have on the future of the HDTV I just bought? Worry not, my techno-curious friend. We have all the answers. I'm reading about "Ultra HD." Is my new HDTV obsolete already? Your TV's not obsolete, but it will soon be a generation behind state-of-the-art. Nuts… So, what does "Ultra HD" mean exactly? Ultra high definition (UHD) is a standard that exceeds high definition (HD). The Consumer Electronics Association defines UHD displays as having a 16:9 ratio (the same as HD) and a minimum pixel count of 3840 by 2160. HD maxes out at 1080p, which is 1920 by 1080 pixels. Okay, so if that's "Ultra HD," what's "4K"? Is that some other format I need to worry about? Samsung is wasted on your dinky display. Right now, the terms 4K and Ultra HD are essentially used interchangeably. 4K is one type of UHD defined by a 2160p resolution (the minimum threshold for UHD), and it's quickly becoming the first widespread UHD standard. Another UHD standard—8K UHD, which has a 4320p resolution (7680 by 4320 pixels)—is out there, but no one uses it yet. It's the same as how both 720p and 1080p formats are considered "high definition" even though one has a much higher resolution than the other (marketing folks sometimes call 1080p "full HD"). 4320p, huh. Wow. That's really impressive. Just remind me, what does the “p” in 1080p, 2160p and 4320p stand for again? I'm asking for a friend who doesn't understand technology as well as I do. Progressive scan. In most everyday uses, “p” can just be thought of as referring to the number of horizontal lines of pixels a display has. So a 2160p display (4K) has twice as many horizontal lines as a 1080p display (HD). It happens to have twice as many vertical lines, too (3840 vs. 1920), for a total of 4 times as many pixels. 4K images are composed of nearly 8.3 million pixels. Compare that to the just over 2 million found in a 1080p image, the full HD resolution produced by Blu-rays. Okay, so 4K has a lot more pixels than HD. But is it really that much better? 4K images are composed of nearly 8.3 million pixels. Compare that to the just over 2 million found in a 1080p image, the full HD resolution produced by Blu-rays. It's nine times as many pixels as a 720p HD broadcast. That's like the difference between an 8-megapixel camera and a 2-megapixel camera. Can I even see all those pixels? It depends. The extra pixels make 4K images look great in the store when you're standing close to the TV. But if you expect to sit on your couch 8 feet away from your TV, you'll need a 60-inch TV or bigger to see the improvement. And the farther from the TV you sit, the bigger the TV you need in order for 4K to make a difference. 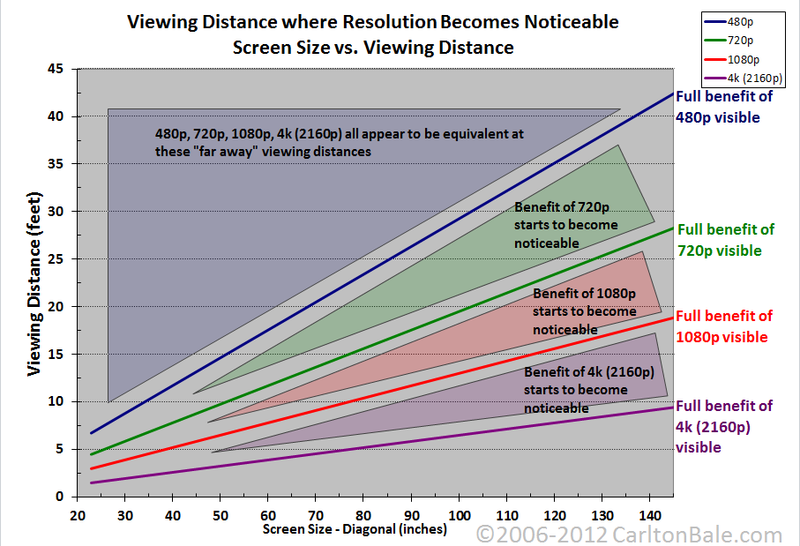 The smaller your TV and the farther you sit from it, the less distinguishable individual pixels become. So 4K mostly benefits viewers who sit close to large TVs. But the Ultra HD standard is about more than just a lot of pixels. The video specs also call for a larger color space, which should make everything look better even if you can't see all of the pixels. That's all well and good, but it's not like there's anything to watch on 4K, right? 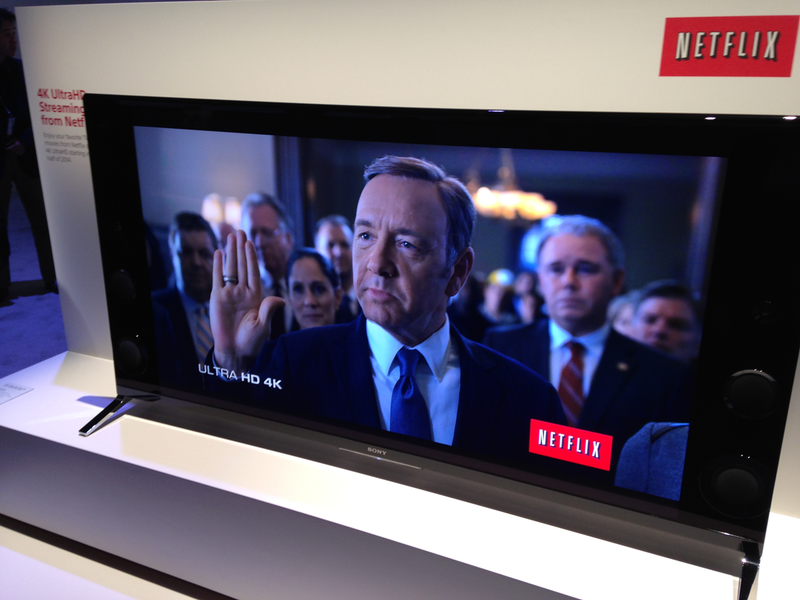 Like all other original Netflix programs in 2014, House of Cards will be shot and offered in 4K. That was a mostly true statement until very recently. But things are changing rapidly: Amazon, Hulu, Netflix, and YouTube have all announced that they will produce more 4K content beginning this year. So, I'll have to buy a UHD TV now just to watch Netflix and YouTube? No, don't worry. Those streaming services will surely make various resolutions available for the foreseeable future. Will my Blu-rays at least work on a UHD set? All of your existing HD content, including Blu-rays, will work on an Ultra HD TV. They'll be scaled up to fill the screen, though, so they won't look as good as true 4K content. The current generation of Blu-ray discs supports resolutions up to 1080p. But the Blu-ray Disc Association has expressed an interest in developing 4K-compatable Blu-rays down the road. So, you're saying I'll need to get some of those “mastered in 4K” Blu-rays? No, those are rubbish. 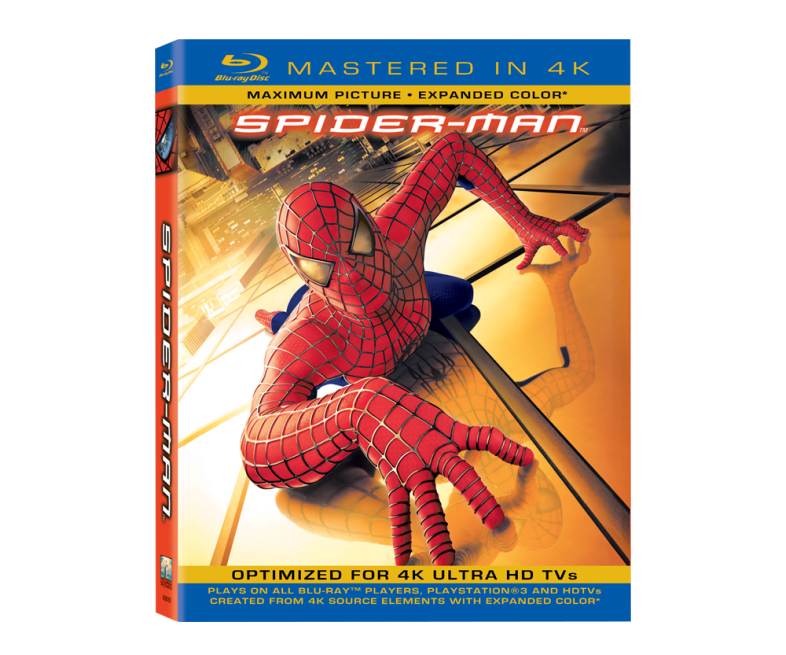 Blu-ray packaging that describes the enclosed disc as “mastered in 4K” or as offering a “near 4K” experience may claim to offer a better viewing experience on a UHD TV, but even the studios behind them admit that they don't deliver a true 4K experience. The video on the disc is still just 1080p. No current Blu-ray can offer 4K resolution, it's just not part of the Blu-ray spec. Indeed! But the more important question may be, why should anyone want physical movies in the age of the streaming services and smart TVs? In the future, physical movies may be as obsolete as physical albums. New video compression formats will allow broadcasters and Web services to stream bulky 4K video files more easily. The International Telecommunications Union recently introduced the H.265 (or HEVC—High Efficiency Video Codec) standard as a successor to the H.264 standard widely used to deliver video via Broadcast, Blu-ray, and Web. H.265 promises to deliver quality comparable to that of H.264, despite using half the bandwidth. In addition, Google has developed its own competing bandwidth-lite format, VP9, which the company will use to stream 4K videos on YouTube. It, too, promises equivalent quality at half the bandwidth of H.264. I'd probably need to buy a bunch of new hardware and stuff to go along with an Ultra HD set, huh? Eventually, yes. Most TV peripherals use HDMI, but only the two most recent version of HDMI (1.4 and 2.0) support 4K resolution. And only HDMI 2.0 can handle a 4K signal at 60 frames per second. HDMI 1.4 is limited to handling a 4K signal at 30 frames per second. Your current cable box, A/V receiver, Roku, Apple TV, and other hardware plugged into your TV probably don't support HDMI 1.4, much less 2.0. Not if they're a couple years old. More frames is important, right? More frames per second means less blur. What limited 4K content there is today tends to be available only at 30 FPS, but this will surely change down the line as more content becomes available. If you're going to make an investment in a 4K TV, you might as well go all the way. HDMI 2.0 was unveiled in September and is still being introduced to the market (not even all 4K TVs have them standard yet). But because HDMI 2.0 is backward-compatible with all previous generations, a new UHD TV with HDMI 2.0 will still be able to "talk" to your old tech. It even uses compatible cables. This 4K stuff sounds interesting and all, but I'll never be able to afford one, will I? Well, the new 4K sets are very expensive right now, but they are rapidly becoming more affordable. 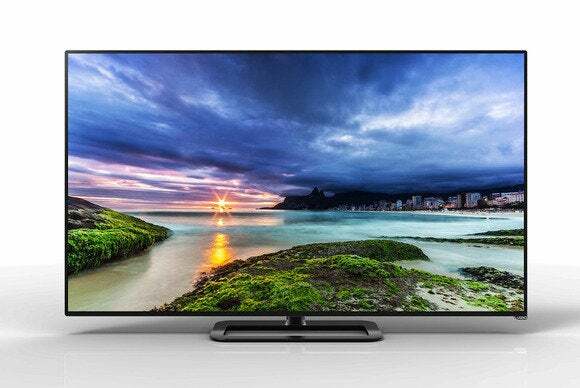 Vizio, for example, recently unveiled a $1000 4K TV. Remember, HDTVs were prohibitively expensive not so long ago, but their prices have come down. At this point, it's hard to find a new TV that isn't HD. I guess I'll have to start thinking about getting a 4K TV—if not this year, then later. But for now I should plan to deal with my plain ol' HDTV? If you recently purchased a new HDTV, don't worry. It's a great living-room addition with lots of available content! Everyone will be talking about 4K, but you can sit tight while the sets become cheaper, quality improves, and content becomes more readily available. That HDTV you just bought has several years of life left in it before you'll want to move on. I know it can be tempting to spring for the latest and greatest thing as soon as it becomes available. But sometimes it's wiser to wait and let the market shake out a little bit. This is one of those times.